Facebook has announced that its two mobile sites — m.facebook.com and touch.facebook.com — have been unified, bringing a simpler mobile experience to Facebook users. And there are a lot of those — a quarter billion, according to Facebook. Smartphone users won’t be losing any functionality because of the consolidation. If your phone supported the enhacned features offered by touch.facebook.com, the new site will automatically flip the switch when you visit. Rolling the sites together helps simplify things for Facebook’s developer team. Now changes can be pushed to a single site instead of two separate sites, which makes it easier to ensure that all mobile users receive a nearly identical experience regardless of the device they’re using. 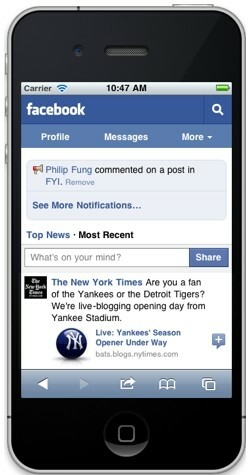 The new Facebook mobile can also check to see if your phone supports geolocation. If it doesn’t, you won’t be seeing much of Facebook Places — which obviously relies heavily on geolocation. Images can also be optimized on the fly to keep page performance from suffering on less powerful devices. You can see the three different versions of the share button below, courtesy our friends at TechCrunch. Facebook launches unified mobile site, announces 250 million mobile users originally appeared on Download Squad on Fri, 01 Apr 2011 10:00:00 EST. Please see our terms for use of feeds.